Thank you ALL so very much for your thoughtful comments about our recent photo shoot with Gridley + Graves! Because Anne and Gary wanted a more "neutral" decor for the shoot, I wasn't able to splash bunnies and eggs around until after they left. 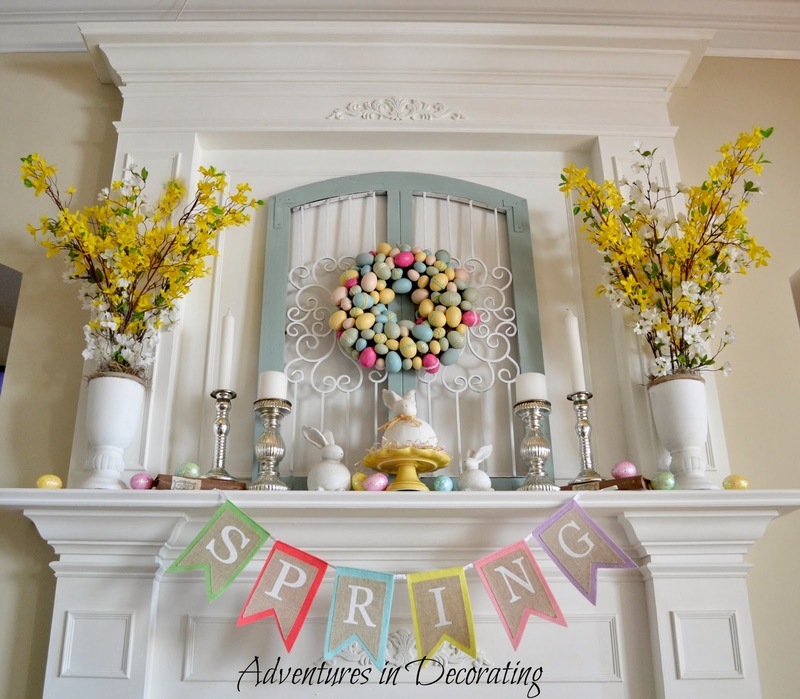 And, since I get quite a few emails asking about the method to my madness when it comes to decorating our mantel and other vignettes, I thought I'd drag you guys along for the ride as I dress our fireplace for Spring. Next, it's time to fill in a bit of the "dead space" on either side of the bunnies ... that's where my silver candlesticks (from IKEA and HomeGoods) come into play ... twins, again (surprise, surprise)! Hmmmm ... our bunnies need a few eggs scattered around! Almost done! We're just missing one, last, whimsical element. THERE we go ... that's a little better (thanks to our cute "SPRING" banner from Target, which is making a return appearance for the 3rd year). 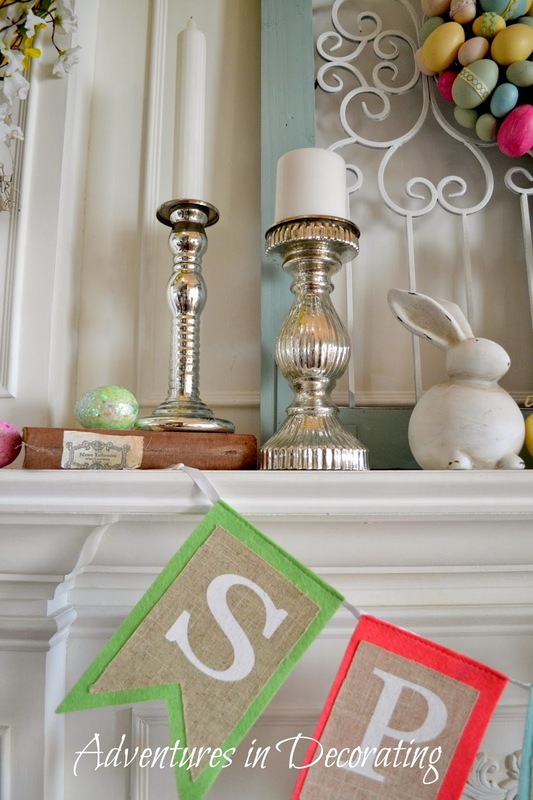 If our mantel could sing right now, I think it just might be belting out my favorite song "HAPPY," by Pharrell! And, there ya' have it ... from sad to SPRING! Our little ol' fireplace is a bit happier now that it's dressed for the season, although, admittedly, I need to add a pop of yellow on the hearth to make it "just right!" Come back soon! I love symmetry too. Just popped up off chaise to re-style my spring mantel. Thanks for the ideas. Blessings. Very pretty, Becca! Love the light colors you used. That piece you used in the middle looks great with the Duck Egg and White. Luv your whimsical touches Becca. I'm having a little give away. Come by if you can. Oh I LOVE this! I'm the same with with the symmetry. Try as hard as I can to get away from it I get so twitchy - just like a bunny's nose! 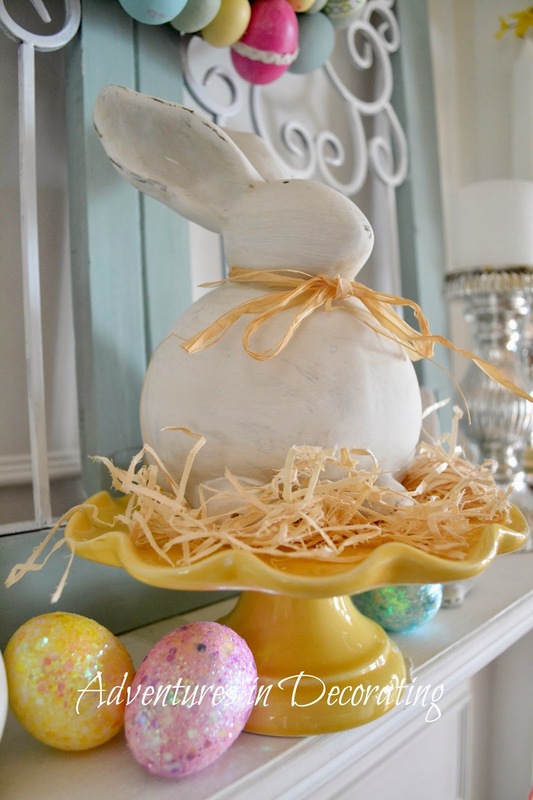 I really liked the yellow cake stand under the bunny to tie in three pops of yellow. Happy Spring! I love the Target banner. Oh Becca I Love it!!! my fireplace/mantel is almost exactly the same as yours. ( apart from mine had a stinking tv in the top part).. don't even get me started!!! Anyways, I love symmetry too, I totally have the OCD gene from my Dad! anyways, it looks darling and I love it! I LOVE EvErYtHiNg! Sweet like candy! 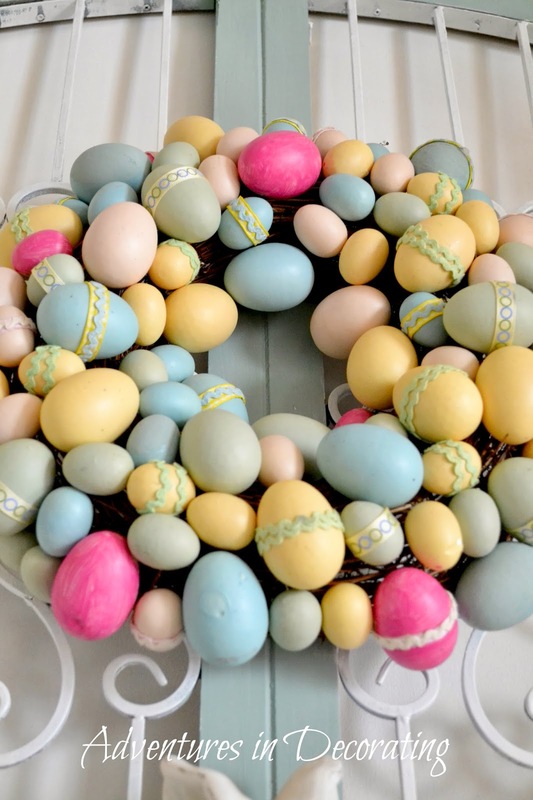 I love Easter decor. 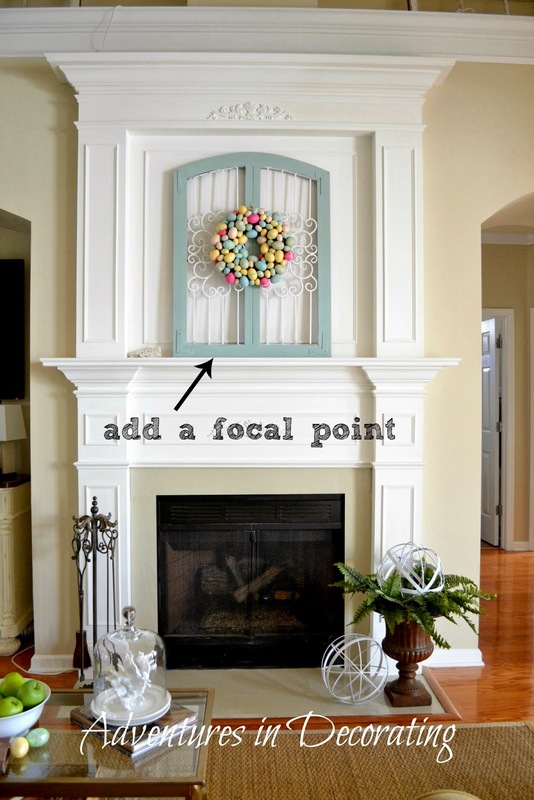 This is a very nice tutorial on decorating a mantel. Thank you. Love it! 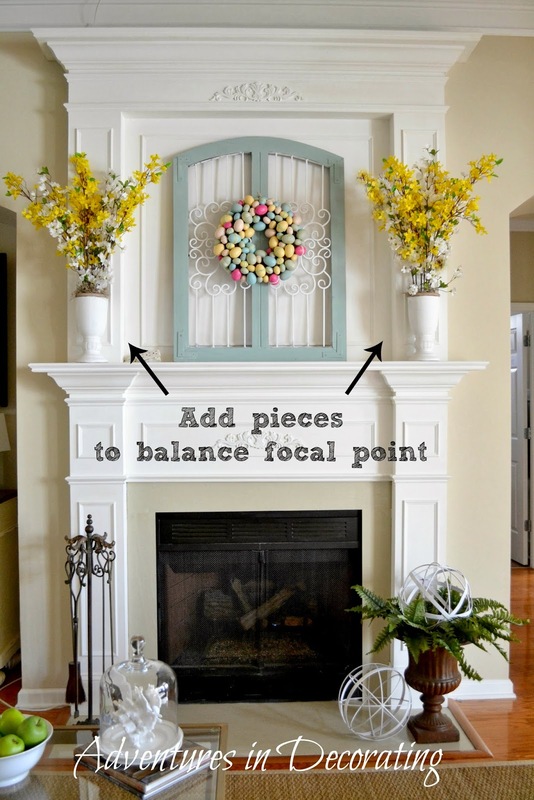 I am a symmetry gal myself when it comes to the mantel. I love all the color bouncing off of yours! it's always good to see how the experts get "the look"! i think i need to get my "spring on" soon! Very, very sweet and so pretty, Becca! How is the house sale going? The real estate market here is a lot better than it was a couple of years ago, so I'm hoping that's true in your area, too. Aw, thank you so very much, Sue ... celebrate your symmetry with me!! LOL Have a wonderful weekend. Thank you, Shannon! And, LOL ... I get twitchy, too, if I stray away from the symmetrical look "too" much! 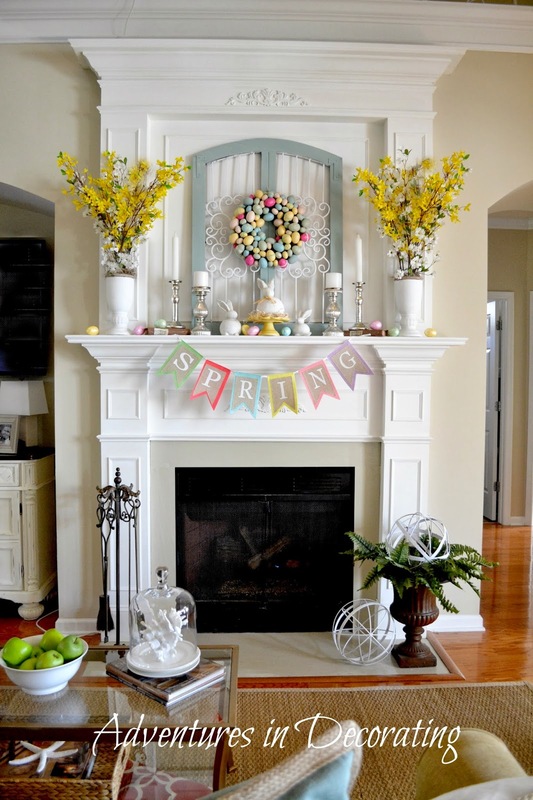 You rock the world with your gorgeous mantels!! !...and I love how you also use symmetry. Gorgeous as always Becca!...Have a beautiful weekend! So cute! BTW, I am hopelessly symmetrical too. Becca this is so GORGEOUS!!! You always do such a great job with your mantle. PINNING!!! Love your pretty Spring mantel! Good job Becca...it's beautiful. 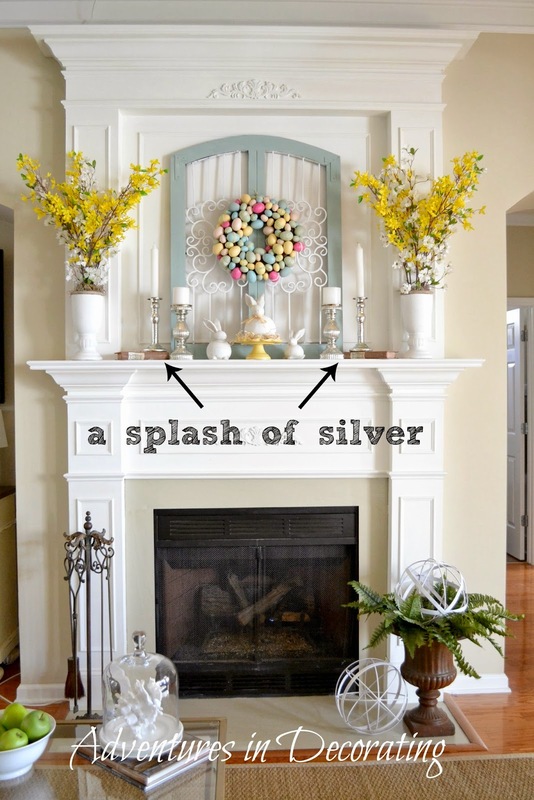 I loved the way you showed the building of your mantel showcase! Becca, I love your mantel. Painting the iron piece was a great idea! It is a fabulous anchor for your mantel! 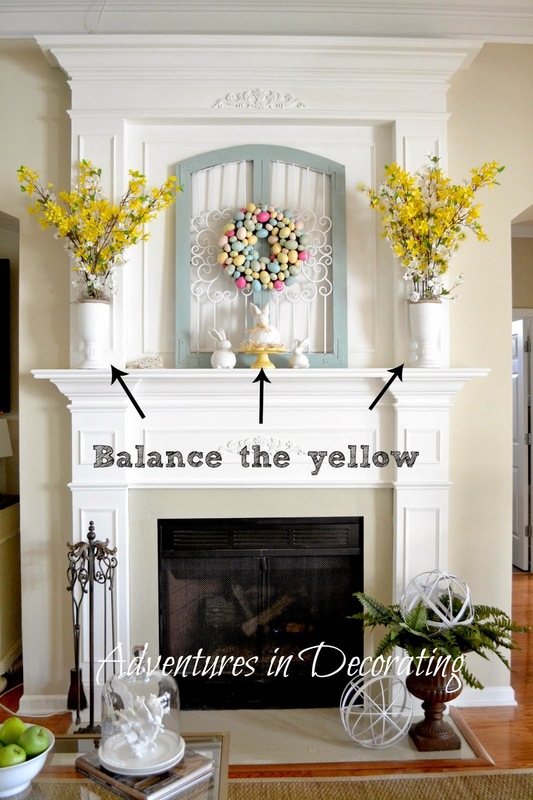 Thanks for the tutorial on styling a mantel. 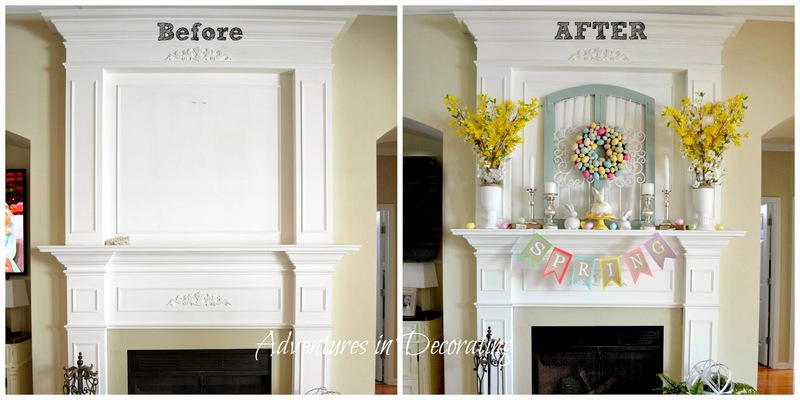 Your mantels are always wonderful! I love the pastel colors! Becca, I've been following your blog for years and you never disappoint me with your creativity but today you had me scared..my first reaction was the wreath was too small for that space, then you kept adding this and that and somehow it all blends and compliments each other. I love it! 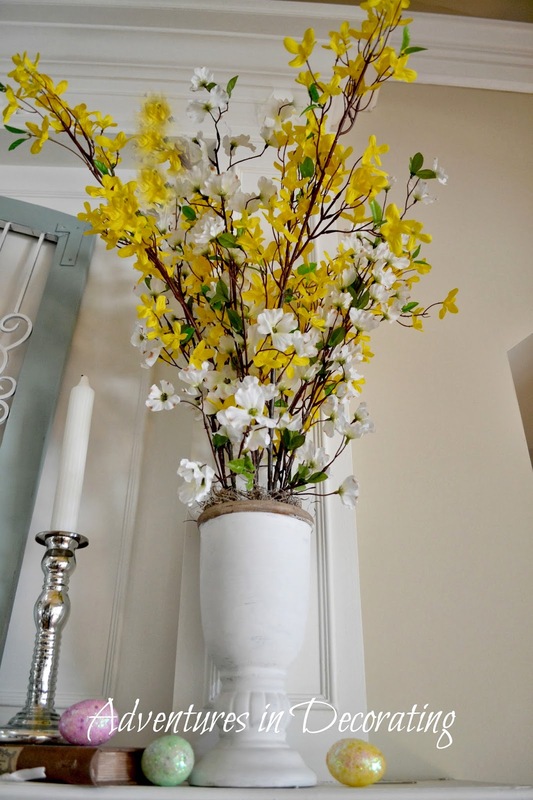 I like synmetry too..What do you have your forsythia and apple blossom silks in? It is hard to tell from the pictures or I need new eyes! Are they small urns? Becca, I think you are a seasonal decorator extraordinaire! 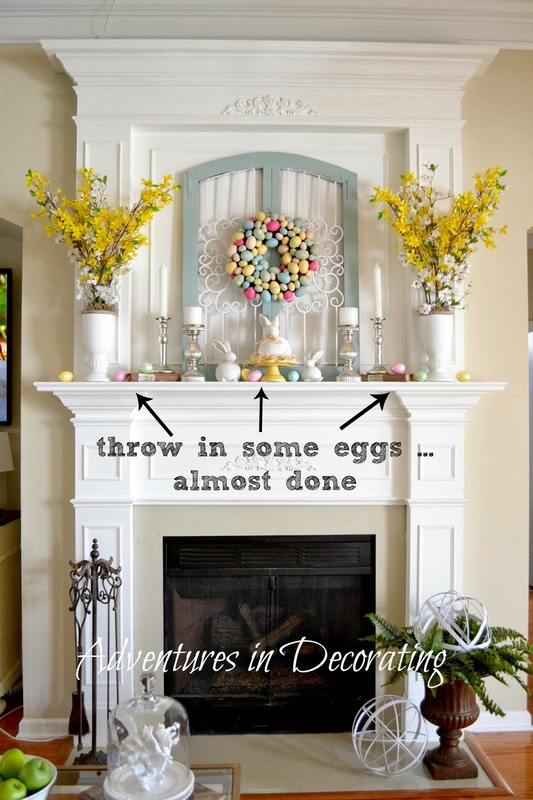 LOVE this mantel... but I love everything you do! Are you going to Haven? Hope so! its wonderful decorating. color combination is so nice. More and more families are moving their living rooms outside for spending cool and warm season in backyard. I found here ideas to create my own outdoor living room complete. Thanks for sharing.